We love our dogs as this old post on Rockstar Pets clearly shows. So it was that lovey-dovey feeling for dogs that led us to Lauren Brown. 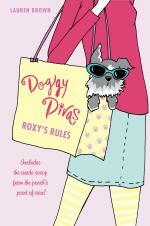 She's the author of a new book series called Doggie Divas. Her books feature good friends, crushes and, of course, dogs. We don't just mean there are cute dogs in the book and on the cover. The dogs in her books actually talk and comment on the 7th grade lives of their dog walkers. Why did you give the dogs speaking parts in the book? I always said that if dogs could talk – we all would be in big trouble! They know all our secrets and see so much of their owner’s lives that the rest of the world never sees or knows about. So, I thought it would be a fun twist if we got a glimpse of the Doggy Diva's world through these dogs’ eyes and got their take on all the drama going on. Here's how one of the dogs, Tyler, describes the trouble with a boy who won't admit he likes Roxy, a main character in the story. Doggy Tyler says: In the dog world, you go after what you want. Fight or flight! If Matt likes Roxy, he’s going to have to fight for her. If not, he should just let her go. Humans! They’re so complicated! So all that got us thinking, what if your dog could talk? What if all dogs could talk? What would they say? Tell us! Arf! Arf! That is so amazing! I absolutely LOVE the ideas! I haven't got a dog (big mistake!) but I think that, with the dog's straight-forward approach to life, they might blurt out just a bit too many secrets. But then again, they could offer you advice. It would be good and bad, depending on your situation. Hi. im kinda ew to this. Um im 10 and still no period. My mom had hers at 13 and my sister had hers at 13. I really scmared because I get cramps sometimes. Does that mean im going to start? And I also get whiteish discharge. I guess thats the good kind,Is the yellow one mean a girls about to start? I had a dog and I think that if they could talk it would be really cool! "are you gonna eat that?! "Can i 'brourow' your fuzzy slippers?Do we HAVE to go on a walk...can't we just dream about walking and say we did it?I want that cat!!" Little Bandit (the cutest dog in the world!) would probably say "stop taking me to the vet!"